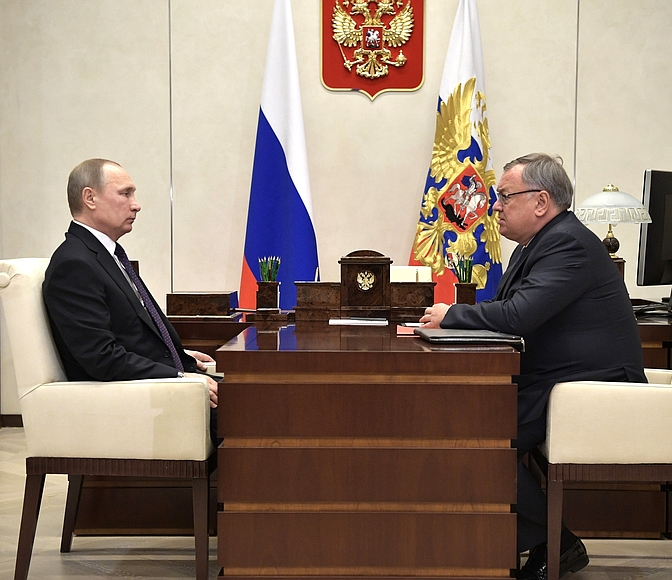 Andrei Kostin briefed President Putin on the bank’s lending to the general public. Mr. Kostin, we met in September last year, when you briefed me on the preliminary results for 2016, and we agreed to look at your progress on mortgages at the start of this year. I also wanted to talk about the bank’s support for some of the programs for the Far East. The year was quite successful, and as far as mortgages are concerned, total mortgage lending was up by 15 percent, and the number of loans provided grew by 40 percent. It is important to note that interest rates on mortgage loans returned to their level before 2014. In other words, there has been a significant drop. We expect our mortgage portfolio to reach the symbolic figure of one trillion rubles at the end of the first quarter of this year. We think that the dynamics will be quite positive this year. We expect a level of at least 10 percent, even with the absence of the state program for supporting mortgage loans this year. I think the process is underway and will continue to develop with good result. Regarding programs in the Far East, one thing I would like to note is that one of our subsidiary banks, Pochta Bank, has reached an agreement with the Far East Development Fund, and starting from mid-year, we will launch a program offering development support to people taking the chance to receive a hectare of land in the Far East. This program will offer small loans of 300,000–500,000 rubles at a preferential interest rate of no more than 8–10 percent. The loans will be for developing the land: building homes or greenhouses and buying farm equipment. We think it will be a good support for developing program. Russian President Vladimir Putin and Board of Chairman of VTB Bank Andrei Kostin. 0 Comment to "Putin met with Board Chairman of VTB Bank"